Our skilled crew of carpenters can complete your Kitchen project with ease and expertise, no matter how large or small. 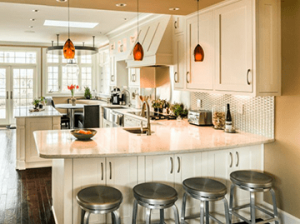 Over 25 years experience in Kitchen Remodeling in and around Morris County and North Jersey. The #1 complaint about kitchen and bath remodeling is how long it takes. Projects that were supposed to take a few weeks stretch out into months. Our unique method of using a small team of elite Master Installers instead of an endless parade of sub-contractors solves this problem. This is why customers love A&E, talk about A&E, and it’s the reason we’ve grown so popular with New Jersey homeowners.